I’m slowly building on a theme of Jungle Blankets! 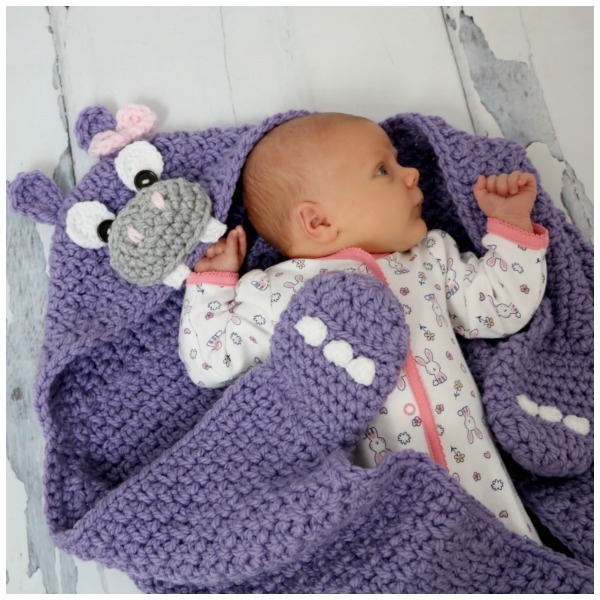 We’ve just added our Crochet Hooded Hippo Blanket to the collection! This summer I posted one of my old photos of a newborn hippo set. 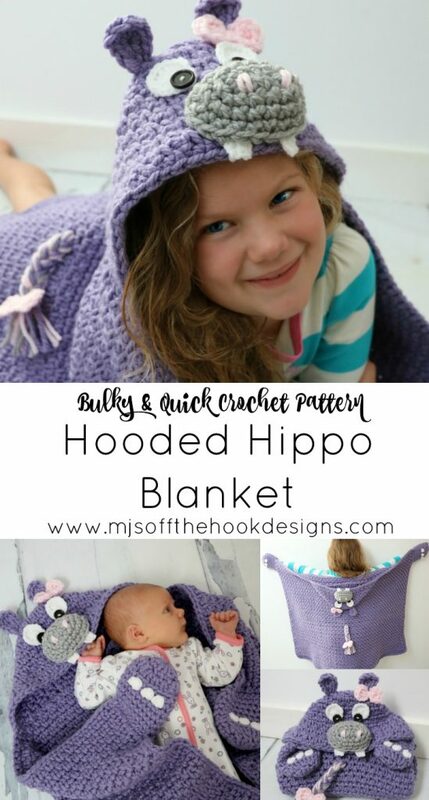 It brought back all the happy hippo feels and I knew I needed to make this blanket! With a brand new little niece I thought this would make a great gift for her too. My jungle blankets have a new size added! I’ve called it baby size but it’s really perfect for a toddler. I wanted the blanket big enough to wrap up the baby nice and snug. 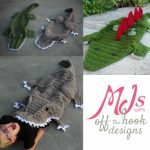 As they grow it makes the perfect play blanket. 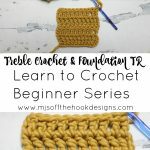 For this size I’ve only used 1 strand of Bulky yarn so it’s not too heavy. 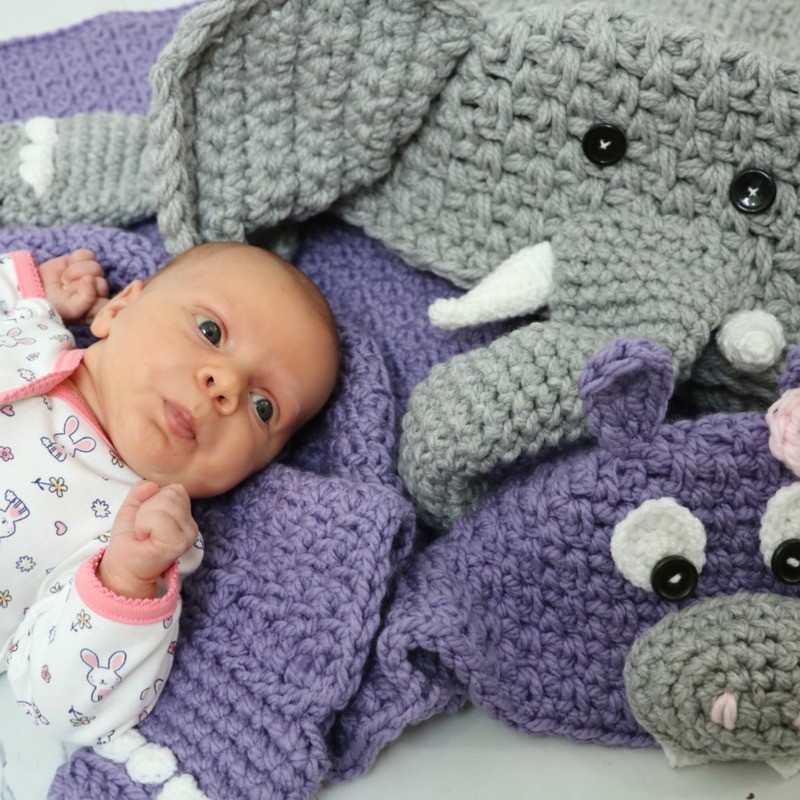 The pattern also includes Child and Adult size so everyone can enjoy this blanket! I’ve modelled Meg in the baby size and it still looks cute even though it’s a little small for her. I like the fact that our baby size will last up to age 6 or 7. 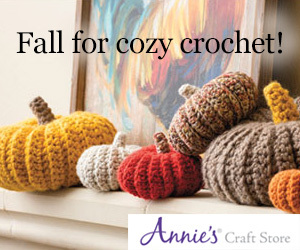 It makes a cute pillow regardless of age making it a great addition to a children’s room. 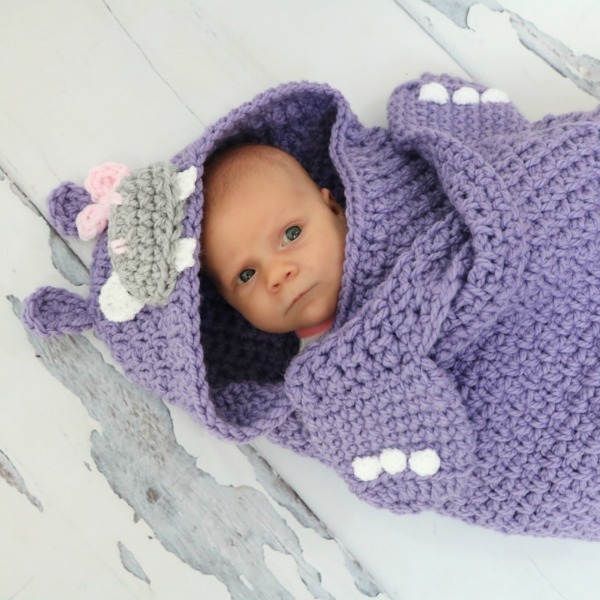 For our Hooded Hippo blanket I used Bernat Softee Chunky in Lavender. 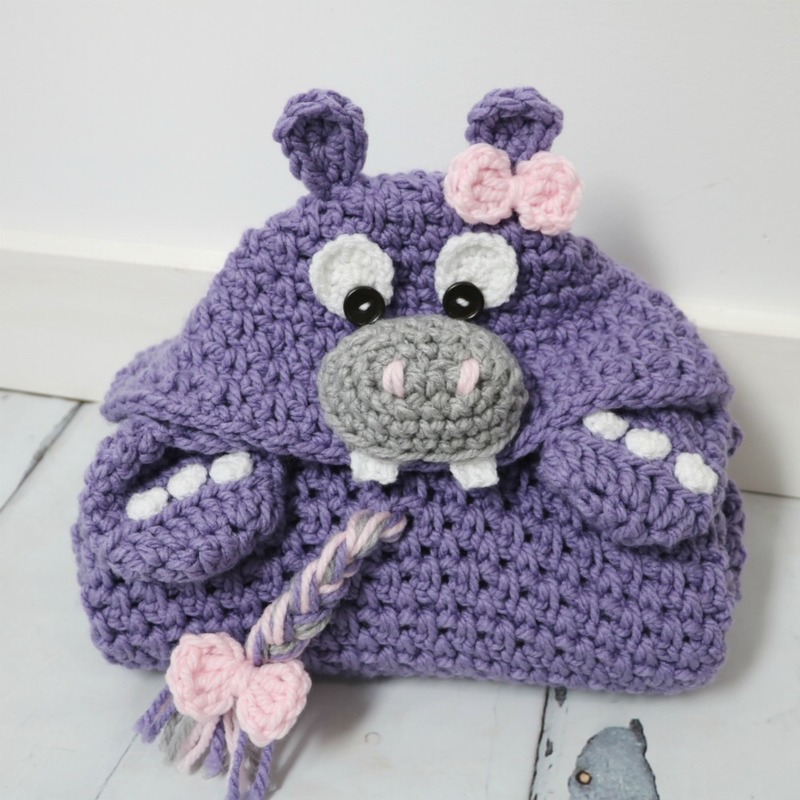 I just love this colour for a hippo but it would also look great in Baby Blue. Here are all the deets if you’re wanting to get the yarn ordered for this blanket! *All sizes need a small amount of worsted weight yarn in white for teeth, eyes and toenails. Another of my Favourite Bulky yarns that makes a great substitute is Sprightly Acrylic Super Bulky. Depending on the size you’re making you’ll need these hooks. I’m a Susan bates lover and use these hooks all the time. 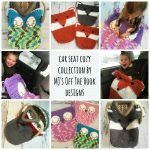 I hope you enjoy this pattern and stay cozy! *This post contains affiliate links at no cost to you! 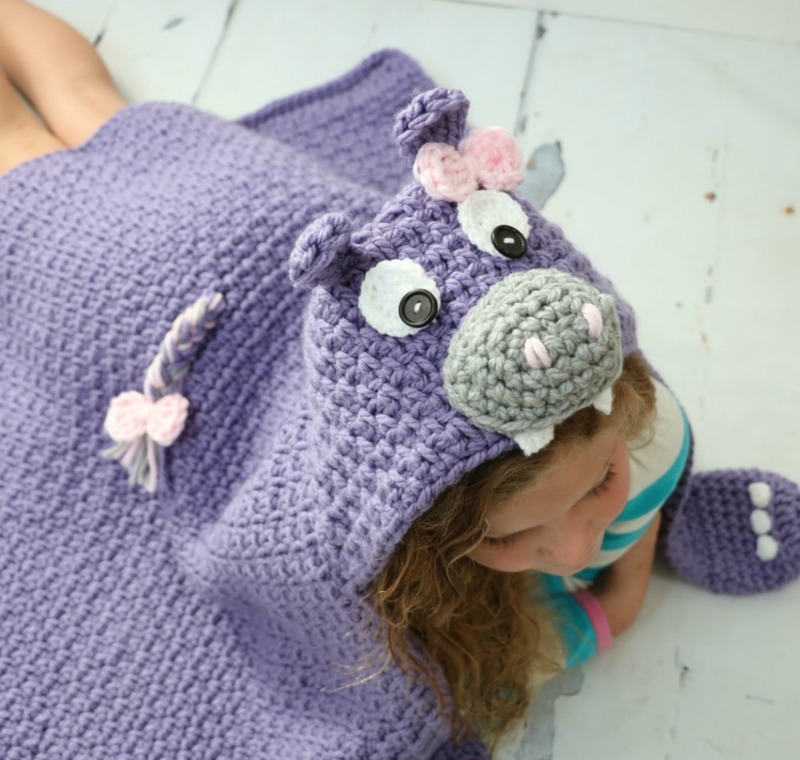 MOST REQUESTED patterns now available! !